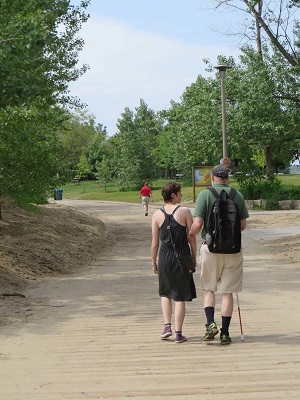 The CCB Toronto Visionaries, in collaboration with our sister GTA chapters of the Canadian Council of the Blind, are holding a 5 km Walkathon along the Woodbine Beach boardwalk. This event will raise funds in support of programs and activities that enrich the lives of those living with vision-loss in Toronto, and to help our members stay active and engaged. This is a "walk-what-you-can" event, so that anyone of any ability can participate. CCB members will be securing donations for any distance up to 5 km, with 100% of proceeds going directly to benefit CCB members across the GTA. Watch Accessible Media (AMI)'s profile of last walk. Time: Gather at 10:00am. The walk starts at 10:30am, sharp. The walk ends back at the Woodbine Beach Picnic Area #1 picnic pavilion, where we'll be holding a Beach BBQ for all those who participated and for those who came out to cheer us on! All the food for the BBQ donated by our generous sponsors, Bloor Meat Market, Cobs Bakery, and Nicholson's No Frills. To participate as a walker, download a detailed information sheet and pledge form here. Or, you can support the CCB Toronto Visionaries chapter's activities and programs by making a donation. Just click the Support our vision link on the sidebar menu. This page last modified: February 12, 2019.